Beside meditation Module 1 of the School of Witchcraft deals especially with pendulum dowsing which is a part of radiesthesia. Radiesthesia teaches you to feel special energies and so strengthens your intuition. However intuition has a hard job nowadays when trying to establish itself against top-heaviness. But radiesthesia helps your intuition very effectively! Because using the pendulum is rather very easy, we took this little aspect of radiesthesia and created a single course for you. So you can give it a try and realize what could be possible if you learned to use you intuition again! During this course you learn what a pendulum is, how dowsing works, what you are actually doing while devining, how you use your pendulum for this and why doing this isn’t magic at all. 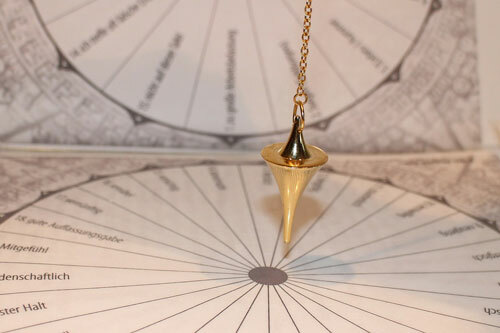 Using your pendulum the right way can easily be learnt. It helps at special decisions, strengthens your gut instincts, makes your thinking more purposeful and offers you the possibility to act less top-heavy. It supports your intuition and therefore is the basis for all kinds of magic!